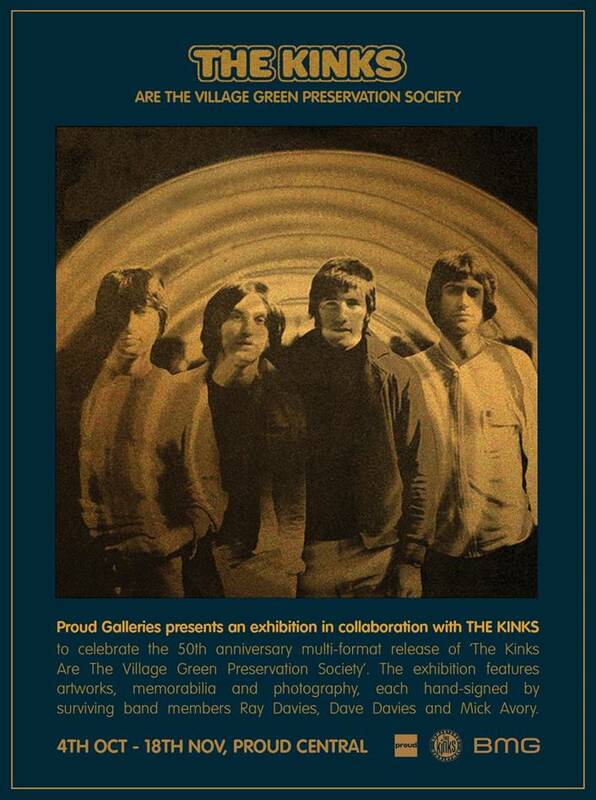 This November marks the 50th anniversary of the release of one of the greatest albums of all time, the Kinks' masterpiece: The Kinks Are the Village Green Preservation Society. To celebrate this milestone, a massive box set is due to be released which will include demos and outtakes in addition to the timeless music contained on the original album. Released near the end of 1968 in a year full of incredible artistic statements from the other leading lights in rock music (including The Beatles' White Album, Jimi Hendrix' Electric Ladyland, The Rolling Stones' Beggars Banquet, and Cream's Wheels of Fire just to name a handful), the Kinks' album was well received critically but not as commercially successful as their previous work. Slightly out of step with the heavier, more stripped down and aggressive sounds of their contemporaries, The Village Green Preservation Society was a lush, pastoral yearning for the simpler and more nostalgic England of the pre-World War II era. It was melodic, quaint, emotional, and very British in sound and feel. Sitting alongside the undercurrent of violence, political unrest, and upheaval present in the world and reflected in the year in rock, the music on Village Green was anachronistic. Still, the band's peers saw its merits, with none other than Pete Townshend of the Who (himself a massive fan of Ray Davies and the Kinks) calling it "Ray Davies' masterpiece." In the ensuing years, the album has come to be seen as the Kinks' high-water mark and one of the greatest albums of both the 1960s and of all time. Because of this, the 50th anniversary of this landmark album has been highly anticipated. To celebrate and commemorate the anniversary of the album, the Proud Gallery in London will be presenting an exhibition called "The Kinks Are the Village Green Preservation Society" from October 4th through November 18th. On display will be a collection of rare photographs of the band during the period of the album's creation in 1968 as well as memorabilia and commissioned artworks by members of the band that will be signed by surviving members Ray Davies, Dave Davies, and Mick Avory (original bass player Pete Quaife passed away in 2010). There will also be photographs from the sessions that produced the album's front and back covers taken at Hampstead Heath in 1968. This looks to be a great exhibition so if you're in London (or close by), be sure to check it out. Speaking from personal experience, the Kinks are one of my favorite bands of all time and The Village Green Preservation Society is one of my top ten albums of all time. It's a beautiful piece of work that all four members of the band were integral in creating and an album worthy of celebrating; it's also a landmark in that it was the final album recorded by the original Kinks lineup. The exhibit at Proud Central should be an interesting and fun trip back to 1968 when the Kinks were one of the great bands in music and were unleashing their greatest work to the world. For more information, visit the Proud Gallery's website. Admission is free and the exhibit will run from October 4th through November 18th, 2018. The Massive Village Green Preservation Society 50th Anniversary Box Set, Containing CDs, LPs, 45s, and a Hardbound Book Will Be Released on October 26th, 2018.